Ramallah (Arabic: رام الله‎ (help·info) Rāmallāh) (literally "Height o God") is a Palestinian ceety in the central Wast Bank locatit 10 kilometers (6 miles) north o Jerusalem, adjacent tae al-Bireh. It currently serves as the admeenistrative caipital o Palestine. 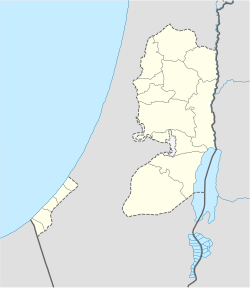 Wi a population o nearly 25,500, Ramallah wis historically a Christian toun, but today Muslims form the majority o the population, wi a strang Christian minority. ↑ "UNdata – country profile – State of Palestine". un.org. ↑ "Projected Mid -Year Population for Ramallah & Al Bireh Governorate by Locality 2004 - 2006". Palestinian Central Bureau of Statistics. Retrieved 2008-02-22. Wikimedia Commons haes media relatit tae Ramallah. This page wis last eeditit on 1 Juin 2018, at 06:40.